The key to a good bowl of soup noodles is the stock or broth. While making stock can be as simple as dumping stuff in water to simmer, understanding some basics will help you get your stock right. Thus, you will have a good base for tasty noodles, soups or porridge, and flavourful sauces for your stir-fry dishes. The Chinese have two types of basic stock: superior and normal stock. Better ingredients are used for the former, which may include meat, dried hams, and dried scallops. For home cooks like ourselves, a normal stock using bones will suffice for everyday cooking. I will only prepare superior stock for Chinese New Year dishes. The most common stock I use is chicken stock. Chicken neck, feet, backbone and wings can be used. This is the reason why I almost always buy whole chickens instead of just going for boneless meat off the shelf. You can get the chicken seller to cut up your chicken or, as I often do, cut it myself. Unfortunately, not many home cooks will bother to retain the discards for stock making. It will need some organization and storage. So, we rely on commercial stocks or flavorings like chicken powder or demi-glace sauces like oyster or abalone sauce. All these are commercially processed with MSG and other preservative added to prop up the flavors. MSG is used often to mask the lack of freshness and taste in stocks. This makes commercial sense but it is actually a poor way of cooking at home. If you learnt to cook relying on commercial stocks, it can be difficult to wean them off. With better organization, planning and understanding on how to prepare good stock, your meals can improve significantly health- and taste-wise. In terms of time for maximum flavour extraction, bones will take the longest, followed by meat, prawns and fish. For pork or chicken bones, I will normally simmer for at least two hours. For fish or prawns, an hour will suffice. The use of a pressure cooker will cut down cooking time for stocks by two-thirds. I highly recommend using it and the modern ones are very safe to use. Bones will give a deep flavour and are great for Laksa or ramen broth. Meat will give a sweeter broth that is perfect for Ipoh Hor Fun or other types of rice noodles where you want a more delicate flavour. I will usually fry or roast prawn heads and shells before crushing them to extract the flavours for a stock. For good brown stock (i.e. sauce for steaks), you need to roast the beef bones or meat before making the stock. 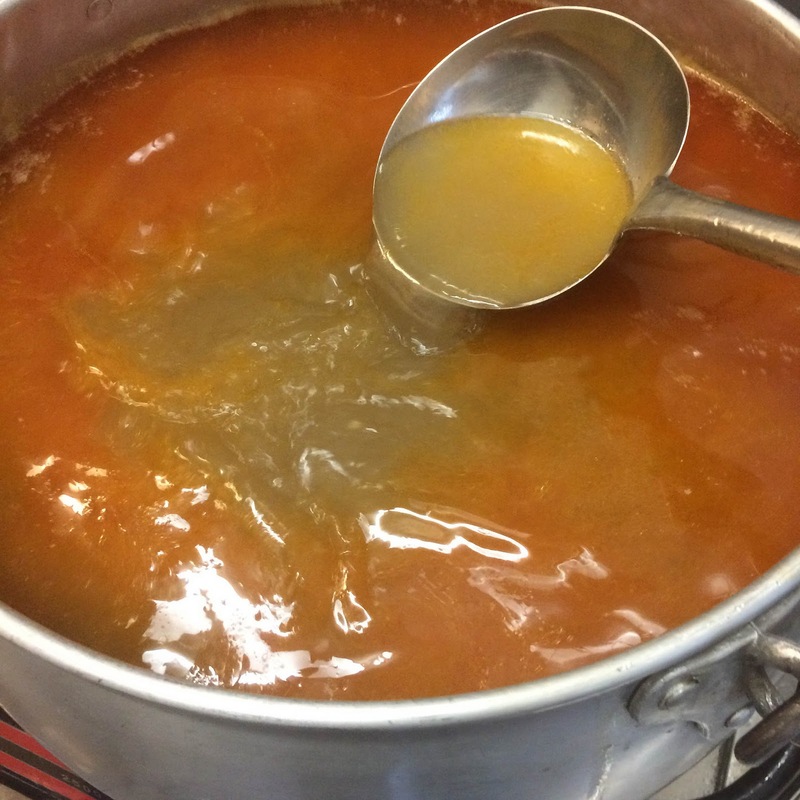 Refinement comes in the second stage when you want to reduce, flavour or clarify the stock. As many flavours are oil-soluble, it is advisable to reduce the amount of fats before you make your stock. You do this by trimming your meat. You can, of course, skim the fat off later but that will also remove some of the flavours. Reduced and thickened stock is good for sauces. You can also make very good vegetarian stock or purees from root vegetables, peas and beans. Many recipes, especially those for noodles, need a good stock-base. If you follow the noodles recipes and think about what you are doing, you are actually learning to make different kinds of broth, which are also the basis for other types of dishes. Ipoh Kai See Hor Fun - Primarily chicken, with secondary seafood flavours. Uses whole chicken with some prawn shells added. Penang Hokkien Prawn Mee - A seafood broth with secondary flavours from meat bones. Uses more prawn shells, maximizing flavours by roasting and blending. Add some chicken bones for a rounder flavour. Pork bones can be added too. The addition of clams or flower crabs shells also enhance the umami flavours. Nonya Laksa - Chicken and pork bones with rempah. Sometimes prawn shells are added. Ramen - Pork bones. As these are normally large ones, you need a longer time to extract flavours. Also dashi, which is seaweed (konbu) and dried fish-flake stock. Assam Laksa - Seafood broth using fish bones and meat, with tamarind added. Fish Soup Noodles - Seafood broth using fish heads and bones. Mee Jawa - Potato and sweet potato puree. Burmese Laksa - Chicken stock with chickpea puree.